full payment will be charged if cancellation notice is no later than two weeks before arrival date. Kimchee Hongdae Guesthouse is the leading backpackers guesthouse in Hongdae Area, Seoul. We provide a truly unique backpacker experience which offers you a safe, comfortable and cheap accommodation with great facilities. We offer free internet access, common areas and of course a great party atmosphere where you can meet other like minded people. Located in Seouls No. 1 Entertainment and Nightlife District, Kimchee Hongdae Guesthouse is within walking distance of restaurants, bars, clubs, and shopping that are open from dusk till dawn EVERY NIGHT!! We are also close to many major tourist attractions such as Gyeongbokgung Palce, GSeoul Namsan Towel, Myeong-dong , Dongdaemun Market etc. Our staff are fun, friendly and enthusiastic about making your stay an experience of a lifetime. 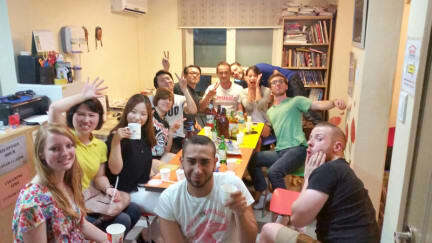 If you are looking to meet great people and have a blast, then the Kimchee Hongdae Guesthouse is the place for you! Our reception/travel desk can help you plan every aspect of your trip. From planning free walking tours of the city to booking show tickets and other fabulous attractions, we have you covered. We also sell a variety of must need items such as tooth brushes or travel adaptors. Reception/Travel desk opens from 7 am to 11pm, 7 days a week. Linen and blankets are free of charge and are provided at reception. While we are located within walking distance of many fabulous restaurants and eateries, we also have a fully equipped and self-catering kitchen open 24 hours. Checking in early or leaving late, don\'t worry! We will be happy to take care of and hold your bags so you are free to further explore the city and all that it offers. Relax, watch movies and cable TV or mingle and make new friends from all over the world in our spacious common room. Enjoy free 24hr access to our high speed computers. We also provide free Wifi service. After a long day or sightseeing, exploring or partying enjoy a hot shower anytime of the day. Enjoy our surrounding night life as last as you want without fear of being locked out. Each guest is provided with 24 hour access to their rooms or our common areas. Enjoy all that Hongdae has to offer! Every night we have nightlife event promoters who will take our guests to some of the trendiest pubs and clubs in the area. We have free Skype long distance calling available 24 hours a day. Wash and dry your clothes in our laundry room. All our guest rooms and common rooms are air conditioned. It is definetely a good place to stay, the people that work there are so nice, the atmosphere is cool and very close to one of the popular parts of Seoul. If you want a great time and dont care about facilities that much, you will enjoy it, if you care about cleanliness and solo time, then i would not recommend it to you. The guesthouse felt very cheap and a little sketchy. The beds were noisy and shook with any little thing. The bathroom had one set of shower shoes, so if they were wet, you had to get your socks/feet wet. There was no lock on the door or anywhere safe to store personal items unless you paid for a padlock. Anyone could have come into the room at any time. I also ended up with a weird bite or breakout on each side of my face, possibly from the pillow. The rooms and beds are dirty. The sheets smell like they've never been washed. The towel they give you has stains all over it. I don't even want to start with the bathroom. The sink was leaking sonyou had to stand in a puddle of water all the time. There was mold all over the floor and walls... Also there are no locks on the room doors, anyone can just go in and out. I definitely don't recommend this place! I have very low standards when I travel and I've done a fair bit of exploring the world on a budget, but this hostel is possibly the worst one I've stayed at! Location is not too bad, but security is a joke, anyone can get in the building and in the rooms as there's no key and it's always open! Cleanliness is disturbing, rooms are bad enough but the toilets are revolting, I stayed for 5 days and the same spots of dirt were still there the day I left. Nice and crusty! Awful. This place is terrible and I would recommend no one to go there. There was blood and human fecies on my bed, the staff wouldn't give us a room key and were so rude when we asked for one. They just sat there and ignored us when we had some problems. The floors are dirty, the toilets were covered in grime and mold and there was sick in the sink. Two occasions where there was no toilet paper in any of the bathrooms. Utterly disgusting! Cleanliness, staff and rooms were just awful!! You should stay in this property if you can find humour in how disgusting it is. Everything is stained, electrical outlets are broken/not working, toilets blocked, and the girl who was on "reception" upon our arrival had all the charm and helpful attitude of a damp stained Kimchi Guesthouse towel. The place is properly rancid. With hostels, you get what you pay for, but I left this hostel feeling like someone should have paid me. It's only saving grace is that it's so bad it actually funny.